Of all the countries of Africa there is one that wears a crown for wildlife, Namibia. Vast cattle properties and industries are beginning to swallow the land where Namibia’s wild animals roam. Poaching is on the rise. Elephants and rhinos are under threat. With the threat comes hope. Namibian government experts, biologists and philanthropists have joined forces to develop simple, innovative strategies to stop the tide of destruction. 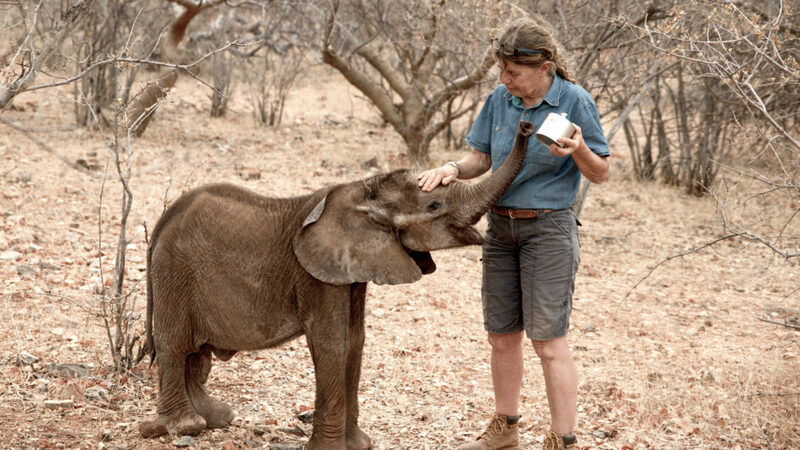 This film is a celebration of the people who are making Namibia a sanctuary for the giants of Africa and an intimate look at the majestic creatures they are fighting for. In South Africa more than one thousand rhinoceros are killed by poachers for their horn each year. And although the situation in Namibia is idyllic in comparison, poaching is on the rise. But how to stop the slaughter? There is a refuge in Namibia where black rhinos still roam freely: Kunene. It is arid, remote and mountainous, unsuitable for agriculture and sparsely peopled. Kunene is one of Namibia’s 14 regions, 115,000 square kilometres of land that borders the Atlantic Ocean. Here we follow a brave team of experts from ‘Save the Rhino’ Trust who are monitoring the rhinos and protecting them from poachers. To help with the enormous effort of monitoring and guarding the black rhinos in the wild, young bulls are captured and released into select, privately owned reserves. The animals are on loan. Their new carers must take full responsibility for their welfare and protection. In return they gain a rare attraction for their safari guests. We follow the dramatic task of rhino capture in Kunene and the bordering Etosha National Park. The home of the black rhino in the Kunene region is also the habitat of the legendary desert elephant. An estimated 50,000-60,000 elephants live in the northwest and east of the country. Desert elephants are not a distinct species, they have adapted to live in arid conditions; they migrate , migrating from waterhole to waterhole along traditional routes. But some of the scarce water resources now belong to farmers and the elephants repeatedly destroy their newly dug wells and wind-powered pumps. The Namibian government has found a solution. In an unpopulated, arid landscape, waterholes are constructed close to the ancient elephant paths. Scientists monitor the thirsty giants’ every step, using radio tags and GPS, learning about the secret life of the desert elephant. When elephants are detected approaching settlements and farms, the villagers are warned. A simple but effective, age-old defence system is deployed; loud noise, fire works and gun fire. The elephants make a wide detour leaving the farmers pumps and wells intact. At the same time, in the far north of Namibia, villagers use chilli. Elephants detest Capsaicin, the chemical in chili that makes it hot. Growing buffer crops of chili protects both wells and ripe food crops from crop-raiding elephants. Giant icons of African wildlife and the fastest land animal on Earth, in some parts of Namibia cheetahs are impacting the livelihoods of Namibian farmers. To save cheetahs and the farms, scientists are giving Namibian farmers dogs to guard their livestock. But these are no ordinary canids. At CCF’s research centre in the Waterberg region, experts raise Anatolian shepherd dogs and Kangal dogs. For centuries these breeds have been successfully used to guard small livestock in Turkey.